The shadow cabinet yesterday discussed David Cameron’s plan to go to war in Syria. A majority of its members favour backing airstrikes in spite of the four conditions laid down by Labour’s conference only two months ago not being met. It is unclear whether there is a majority of members favour imposing a whip in support of their view on other Labour MPs against the party’s policy, but some certainly favour that. The decision will be made on Monday. There is a real danger that such an approach would push Labour towards a split at a time when it is united against austerity and has the Tories on the run – with yesterday’s Daily Telegraph announcing the “end of austerity“. The only way to keep the party united on this issue is to trust the members and the party conference. Clear and unambiguous authorisation from the United Nations – As confirmed by a Chatham House expert, UN Security Council resolution 2249 carried last week does not provide a legal basis for military action by the UK as it does not invoke Chapter VII of the UN charter authorising the use of force. David Cameron claims to justify it, legally, on the basis of the collective self-defence of Iraq and the individual defence of the UK which are each tenuous in any event and which do not meet the condition. A comprehensive EU-wide plan to provide humanitarian assistance to the consequent increase in the number of refugees – In fact, the EU refugee plan is unravelling and the approach to refugees is highly fragmented. There are already 4m refugees in countries bordering Syria and 6.5m displaced internally. This is bound to increase as bombing escalates. That bombing is exclusively directed at military targets directly associated with ‘Islamic State’ – this cannot be satisfied when it is known that ISIS/Daesh is already using human shields to protect themselves against RAF drone strikes. That any military action is subordinated to international diplomatic efforts, including the main regional powers, to end the Syrian civil war – but unfortunately the shooting down of a Russian plane by Turkey on top of differing approaches to the Assad regime and continuing ethno-religious conflict make a broadly-based, sovereign Syrian government that could retake territory currently controlled by ‘Islamic State’ a diminishing prospect. If shadow cabinet members persisted in pressing that Labour MPs to support military action, would Jeremy Corbyn have any alternative to sacking shadow cabinet members in order to defend party policy? There is an argument for whipping party members against Cameron’s proposals, in line with party policy. There is an argument for giving MPs a free vote in an attempt to minimise disunity. But there is no argument consistent with party policy for doing what some shadow cabinet members appear to wish. Posted in: International, Labour, Middle East/North Africa, Politics, War/Defence. What should happen if the majority of the Cabinet vote to agree that the 4 conditions have been met to their satisfaction? Cameron’s proposals are simply a warmed up version of the Assad regime-change ones from 2 years ago. But worse than that they include a new ‘dodgy dossier’ with laughable claims about 70,000 non-Islamic ‘moderate’ rebels. These ‘moderates’ of course include the al-Qaeda affiliates in the al-Nusra Front and the scum that shot the Russian pilot as he parachuted to the ground and then chanted ‘Allahu Akbar’ over his body. In other words, it is a ‘plan’ that has clearly been written for Cameron by his Saudi and Turkish masters who appear to be in charge of our foreign policy these days and the really shocking thing is that despite Iraq, despite Libya, so many Labour MPs are apparently falling for the same scam all over again as the war drums beat. Of course the worst offenders are the entryists in groups like the Henry Jackson Society (that is rabidly pushing for both Trident and a new war, not a great combo), with just today HJS member John Spellar launching yet another media attack on Jeremy. Right now the key task is to lobby every Labour MP as hard as possible and give Jeremy who is absolutely correct on Syria as much public support as possible (social media, letters to local and national papers, radio phone-ins etc.). Does anyone here seriously believe, even for one moment, that there is even the remotest possibly that the PLP, (“you can hire an MP the same way you’d hire a London taxi,”) won’t support the Tories on this as issue they have done on almost everything else ? As for that nice Liberal Democrat JC, well frankly no one really cares what he thinks, what’s he going to do about it anyway; resign ? Glad you pointed out party policy but the more I watch the PLP and many in the shadow cabinet the more it appears to me that some kind of split in order to weaken Corbyn and an attempted coup from the assassins left behind ‘enemy’ lines will come. Arguments such as the one above should mean that if Corbyn whips the PLP over Syria the split will be averted at this stage, as those who split would be on rocky ground within the party given conference decisions. However, the perpetual sniping in the press from ‘inside sources’ without some form of action by them will weaken the snipers over time as the cry ‘put up or shut up’ will grow amongst members. They only need a few ‘noble souls’ to fall on their swords, remember the Gang of Four. However, they need a principled stand to sell it to members and Labour voters and run counter to party policy. Bombing Syria might appear principled in the light of the horror of Paris, but memories fade and may well be replaced by horror in Syria, particularly as the bombing of Raqqa is unlikely to stop the international terrorism, even if ISIS are weakened. At that stage a split over this issue so far from a general election could well be a wasted bullet and they only have this split option once. We need Labour MPs who reflect the grassroots and bottom up democracy. Some of Labour’s Little People don’t seem to recognise that it is the end of the ‘Great men and women of history’ and time perhaps (globally) for The Great Masses of History. Grassroots, bottom up, democratic & peaceful. Labour lost the support of huge numbers of voters who believed that Tony Blair was a liar and a war criminal. We now have a leader who is honest, opposed to war and has a massive amount of support amongst the general public. And the PLP want him to resign! The Chatham House URL seems to be behind a paywall now, but this http://is.gd/KC65cA from the European Journal of International Law confirms that UN SCR 2249 does not change the context of the law, actions must be in self defence and conform to the laws of war. The turmoil around this vote is not so much the biggest challenge to face Corbyn as party leader, but his biggest opportunity … an opportunity to route the Kendallistas and send them back to 5% oblivion. If he plays his cards right Corbyn could relegate Mactaggart, Spellar, The Daily Mail man, etc to that wee corner of the opposition benches. Corbyn is the right man for Labour just now … but if he doesn’t have a pair of balls he needs to grow them now. The views of too many of our MPs have long been vastly out of step with the rest of the party, they have got away with ignoring us up till now, but they have had a glimpse of what the party really looks like – and they don’t like it. Too many were hand picked and parachuted in by Blair and Brown, with the local parties views as to who THEY wanted simply ignored. Time for some real Labour MPs, this treacherous load of shite has to go! This is no longer about Syria, it is not even about ISIS, it is about Corbyn. The New Labour wreckers see this as an opportunity to force his resignation and have worked themselves up into a swivel-eyed petit-bourgeois funk. They are desperate to start killing children so they can Get Corbyn. But Corbyn only has to stick to his guns so to speak and impose a three line whip against them voting for Cameron’s pointless war crime and even if they out number him in Parliament the New Labour MPs will come out of this hugely weakened and Corbyn hugely strengthened. Interesting that most of the Tory press today are completely schizoid about the issue. The Times today has about 4 full pages of the most spume-flecked, lying, anti Corbyn ranting – but then none of their journalists in their “analysis” or commentaries on the argument for starting bombing Syria give any credence to ANY of Cameron’s supposed “compelling arguments” ! Particularly the la la land fantasy of the supposed 70,000 anti fundamentalist fighters ready and willing to take on Daesh in the non Kurdish areas of Syria. One of the things (apart from their disloyalty and rank opportunism) that I find most sick bag inducing about the comments of the likes of Hillary Benn is their shameless adoption of the Tory “buzz phrase wording of the moment” , ie “the case for war is compelling — to keep our nation safe”. If these self-serving career politicians now want to simply adopt all the Tory head office propaganda spin word for word it is time for us to chuck them out of the Party ASAP. When I was a young Harold Wilson refused to take this country to war in Vietnam despite all the reasons the Americans could provide. Australia among others did. We talk now of the use of chemical weapons. Agent orange otherwise known as dioxin was was used in the conflict by America resulting not only in the deaths of the local population but also of their own forces. its simple,if you don’t want to take action against these isis religious fascists who are commiting some of the worst war crimes against innocent civilians including children in Iraq and syria since hitlers and the Nazis did world war 2. well have that on your cowardly conscience corbyn and co,but as a labour voter, I have written to my mp today to ask her to vote for military action against these mass murdering,homophobic,racist,nazi,fascists of isis and rid them from the face of this planet. I didn’t think anyone with even half a brain still read the SUN; apparently I was wrong. Rupert Murdoch 10 common sense 0. Half a brain? You flatter him. Thanks for the analysis of the conference decision. It’s a simple matter of democracy: if there’s party policy on an issue, that ought absolutely to preclude a free vote. I suppose if you are going to have Assadists and Putinites you might as well have Zionists too? Seems there is to be a Free Vote after all. Cue right wing commentators who earlier today would have been saying that imposing the whip would be disastrous for Corbyn’s leadership now saying deciding not to impose it will be disastrous for Corbyn’s leadership. In actual fact I think this is a mistake if not worse. Even if Corbyn says the Labour Party is against Cameron’s War it will be Labour MPs that facilitate it in the end and that is what the general public will see. They will not see Corbyn’s opposition only the actually existing war made possible by Labour MP’s votes. Corbyn seems to have reduced himself from leader back to marginalized opposition within the PLP as if the leadership election never happened. It’s a bit of a Syriza moment when they suddenly voted for EU austerity. Even so I think Corbyn will remain leader, just not a radical leader, because there is no other way back for the right wing. They are far too discredited and electorally toxic so they need him as cover. But it won’t work. The pasokification of Labour that began towards the end of Blair’s rule and which we hoped the election of Corbyn had ended and reversed will simply resume and possibly even speed up. A fractious Labour Party is not in anyone’s interest but it’s harder to reconcile that the majority of caucus are genuinely Blairite in outlook while the membership is not. From what has emerged from the caucus debates, an argument was made that “on such a serious issue as going to war”, members are act in accordance with conscientious belief. Problematically, as almost everything a sitting member does should be considered a matter of seriousness, the door is kicked open for every issue promoted by Corbyn to be rejected by genuine Blairites under the same pretext. A similar argument is that serving MPs are elected under mandate from the manifesto that was put before the electorate. It would be a mistake to argue that a refusal of parliamentarians to align with evolving party policy is necessarily antidemocratic… it’s just a question of whom they really represent and under what mandate. 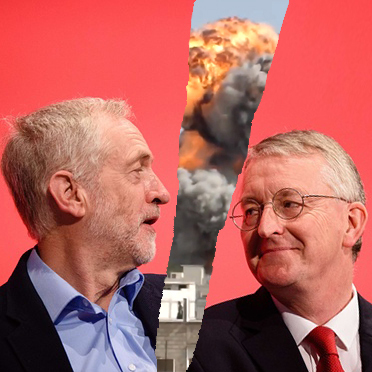 Disunity between the PLP and membership is unavoidable and plainly evident. I personally believe it is impossible to argue with a parliamentarian whom states their constitutional role is to represent their electorate. However, Cabinet members are different as their specific role is to represent and espouse party policy. The problem is that the top-down structures of the party effectively limit the role of membership in policy discussions to annual conference. Shadow ministers are effectively accountable to no one but (nominally) the parliamentary leader. It’s too easy for everyone to claim they have a mandate to do whatever they want. The answer can’t be an increasing authoritarianism of “leadership” within Parliament – it must be the growth of real-time representative structures within Labour that can provide insight into the views of the party at-large.